Komitetui leidžiama rengti klausymą konkrečia darbo tema, kuriame kviečiami dalyvauti ekspertai. Du ar keli komitetai gali rengti bendrus klausymus. Dauguma komitetų rengia reguliarius klausymus, kadangi juose galima sužinoti ekspertų nuomonę ir aptarti pagrindinius klausimus. Šiame puslapyje rasite visą turimą informaciją, susijusią su komitetų klausymais, įskaitant programas ir pranešėjų kalbas. 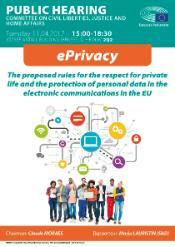 On 11 April 2017 the LIBE Committee organises a hearing on the proposed rules for the respect for private life and the protection of personal data in the electronic communications in the EU” (ePrivacy), presented by the Commission on 10 January 2017. The hearing is part of the works conducted by the LIBE Committee with a view to preparing its report on this proposal. The rapporteur is Ms Marju LAURISTIN (S&D). It will address different elements of the new proposal, such as its legal consistency with other legal instruments or the level playing field or the confidentiality and security of electronic communications. The hearing seeks to provide the LIBE Committee with the views of the main actors involved: telecommunications sector, new communication services provides (OSP, OTT), consumers, NGOs, professors, European data protection authorities and the Commission.